Depending on your outlook, if you’ve not seen Sonic Underground before, that might be considered a good thing. It’s no secret that the show wasn’t that great. But if you’ve ever had a desire to see the show today is your ‘lucky’ day. 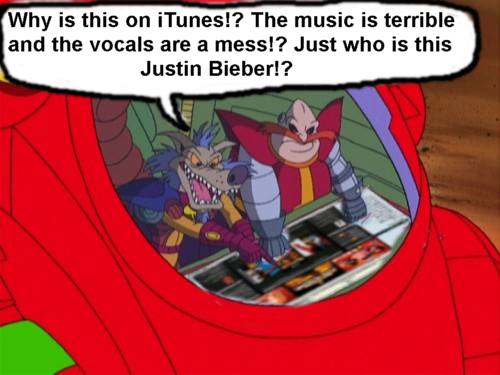 Series 1 & 2 of Sonic Underground is now available to download on iTunes. So if you’ve never seen the series before and feel like giving it a shot, by all means head over to iTunes and download away. Episodes are priced at $1.99 each and each volume (20 episodes) can be bought for $27.99. I probably should point out here that the entire 40 episodes are available on DVD and can be purchased for much less than that. Also as a side note, Sonic Underground will also be getting a ‘conclusion’ in Sonic Universe #50 later this year. Finally! Classic Sonic is back in action! Yeah because nothing says classic Sonic like his brother and sister who are looking for their mother whilst they battle robots with the power of music. It was probably disney who did this, since they have rights to show episodes on disney xd (and they do :'( ). Does anybody else here know that the whole series is available on Netflix online, along with Adventures of Sonic the Hedgehog and the best one, Sonic the Hedgehog SatAM? Jaleel White did voice all three hedgehogs in the show. So that might be the reason. But yeah, she does kind of sound like Steve Urkel’s sister (I forget her name). Just who is this Justin Bebier? L…O…L…. I do have fond Memories with Sonic Underground I remember watching it every saturday morning on Disney’s Diggit on ITV in 1998 good times. I even have the old 2004 Complete series DVD box set. oh crap not THIS. (music plays) smosh and me: SHUT UP!!! I think that Sonic Underground was one of the best tv series of Sonic the Hedgehog ever made. It’s more creative then Sonic SatAM and STH. Eh. I’m more of a SaturdayAM fan.